As the incidence of diabetes has steadily increased over the last several decades throughout the United States, diabetic foot infections have also become increasingly common. As many as one in four people with diabetes will have a foot ulcer in their lifetime, and these wounds can easily become infected. If left unchecked, they can spread and may ultimately require amputation of the toe, foot, or part of the leg. Nearly 80% of all nontraumatic amputations occur in people with diabetes, 85% of which begin with a foot ulcer. “Lower extremity amputation severely affects quality of life in people with diabetes because it reduces independence and mobility,” says Warren S. Joseph, DPM, FIDSA. “Furthermore, about 50% of patients who have foot amputations die within 5 years, which ranks as a worse mortality rate than for most cancers.” However, about half of lower extremity amputations that are not caused by trauma can be prevented through proper care of foot infections. Preventing amputations is vital. In most cases, these infections can be prevented or cured when properly managed. In a 2012 issue of Clinical Infectious Diseases, the Infectious Diseases Society of America (IDSA) published a clinical practice guideline for diagnosing and treating diabetic foot infections. 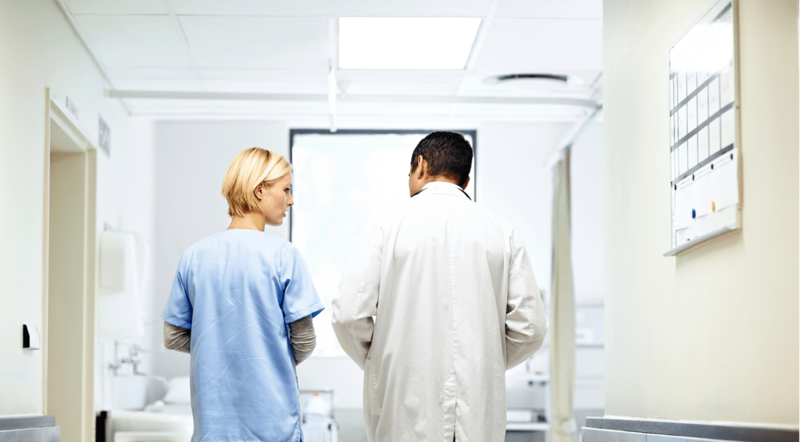 The guideline addresses 10 common questions with evidencebased answers that experts have determined are most likely to help healthcare providers treating these infections. The guideline is a revision and update of IDSA’s 2004 recommendations for managing diabetic foot infections. When foot sores are infected, imaging the foot is usually necessary to determine if the bone is infected. The guidelines recommend performing a culture of the wound to determine the bacteria causing the infection but stress the importance of appropriately obtaining those cultures. This information can be used to guide clinicians on whom antibiotics should be provided for treatment. The guideline emphasizes the importance of rapid and appropriate therapy for treating infected wounds on the feet. Therapy can include surgical debridement of dead tissue, appropriate antibiotic therapy, and removing pressure on the wound and improving blood flow to the infected area, when necessary. Importantly, many diabetic foot ulcers are not clinically infected and therefore should not be treated with antibiotics. People with clinical evidence of infection, however, require antibiotic therapy. Those with a severe infection should be hospitalized immediately. “Many patients with foot infections initially receive only antibiotic therapy,” Dr. Joseph says. “In many cases, providing antibiotics alone will be insufficient in the absence of proper wound care and surgical interventions. Unfortunately, clinicians often overprescribe or inappropriately prescribe antibiotics for diabetic foot wounds. 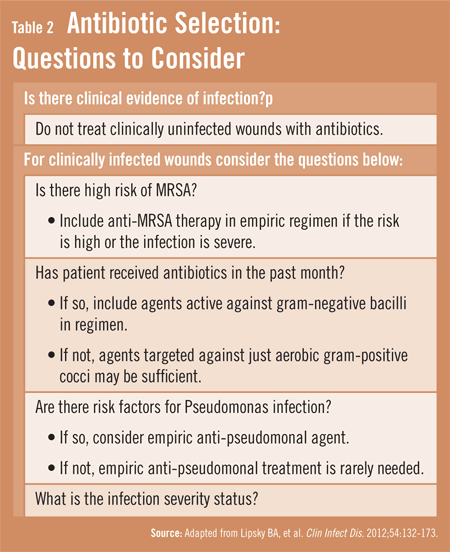 This approach is ineffective and can lead to antibiotic resistance.” Before considering antibiotic therapy, it is important to balance the clinical evidence of infection and its severity with other risks, such as risk factors for MRSA and Pseudomonas infection (Table 2). When antibiotics are necessary, they should be discontinued when the infection is gone, even if the wound has not completely healed. Since treating diabetic foot infections can be complicated, the guidelines recommend involving a multidisciplinary care team that can assess and address various aspects of the problem. “Data have shown that many foot infections are treated improperly,” says Dr. Joseph. “Getting assistance from other providers—including infectious disease specialists, podiatrists, surgeons, and orthopedists—can best address the complicated care of these infections.” For providers in rural areas, the guidelines note that telemedicine may facilitate consults with appropriate experts. Lipsky BA, Berendt AR, Cornia PB, et al. 2012 Infectious Diseases Society of America clinical practice guideline for the diagnosis and treatment of diabetic foot infections. Clin Infect Dis. 2012;54:132-173. Available at: http://www.idsociety.org/uploadedFiles/IDSA/Guidelines-Patient_Care/PDF_Library/2012%20Diabetic%20Foot%20Infections%20Guideline.pdf. Apelqvist J, Bakker K, van Houtum WH, Schaper NC. Practical guidelines on the management and prevention of the diabetic foot: based upon the International Consensus on the Diabetic Foot (2007) Prepared by the International Working Group on the Diabetic Foot. Diabetes Metab Res Rev. 2008; 24(Suppl 1):S181-S187. Frykberg RG, Zgonis T, Armstrong DG, et al. Diabetic foot disorders. A clinical practice guideline (2006 revision). J Foot Ankle Surg. 2006;45:S1-S66. Sotto A, Richard JL, Combescure C, et al. Beneficial effects of implementing guidelines on microbiology and costs of infected diabetic foot ulcers. Diabetologia. 2010;53:2249-2255. Tan T, Shaw EJ, Siddiqui F, Kandaswamy P, Barry PW, Baker M. Inpatient management of diabetic foot problems: summary of NICE guidance. BMJ. 2011;342:d1280. Singh N, Armstrong DG, Lipsky BA. Preventing foot ulcers in patients with diabetes. JAMA. 2005; 293:217-228. Haller NA, Gil KM, Gardner WG, Whittier FC. Patient computer use to prompt doctor adherence to diabetes management guidelines. J Eval Clin Pract. 2009;15:1118-1124. Schaper NC, Apelqvist J, Bakker K. The international consensus and practical guidelines on the management and prevention of the diabetic foot. Curr Diab Rep. 2003;3:475-479. Hellingman AA, Smeets HJ. Efficacy and efficiency of a streamlined multidisciplinary foot ulcer service. J Wound Care. 2008; 17:541-544. Warren S. Joseph, DPM, FIDSA, has indicated to Physician’s Weekly that he has served as a consultant for Merck, Pfizer, and Cerexa, and has worked as a paid speaker for Merck and Pfizer. The office personnel need to be educated in recognizing the risk of the diabetic foot. Often times the patient presents with weeping sores on the foot and it is not recognized as an issue. Having a simple look at the patients foot by an educated eye can be a very valuable assessment, an even then, we must convince a patient whose foot has an open weeping sore that it is a huge issue, as the patient may not hurt, cannot see it, an has other more important things to do in his/her life, than to stay in the hospital.